Islamist extremist organisations are receiving hundreds of thousands of pounds a year - mainly from small, anonymous public donations from UK-based individuals, a Government report has found. Home Secretary Amber Rudd has decided against publishing the long-awaited document in full because of national security concerns and the volume of personal information it contains. She said the "most common source of support for Islamist extremist organisations in the UK is from small, anonymous public donations, with the majority of these donations most likely coming from UK-based individuals". "In some cases these organisations receive hundreds of thousands of pounds a year," Ms Rudd added. "This is the main source of their income." She said the donors may not know or support the organisations' full agenda. The report was commissioned by then prime minister David Cameron in November 2015. The Home Office review into the nature, scale and origin of the funding of Islamist extremist activity in the UK also examined overseas sources. For a small number of organisations with which there are extremism concerns, overseas funding is a "significant source of income", the report found. But for the vast majority of extremist groups in Britain, overseas funding is not so important, according to the review. Ms Rudd said the report "gives us the best picture we have ever had of how extremists operating in the UK sustain their activities". The review also says that some Islamic organisations of concern are posing as charities to increase their credibility and to take advantage of Islam's emphasis on charity. Some of these are deliberately vague about their activities and their charitable status, according to the review. Support from abroad has allowed individuals to study at institutions that teach "deeply conservative forms of Islam", the report found. Such support also provides "highly socially conservative literature and preachers" to the UK institutions and some of these individuals have since become of extremist concern. Ms Rudd said the Government would be directly raising issues of concern with "specific countries as part of our wider international engagement on countering extremism and violent extremism". 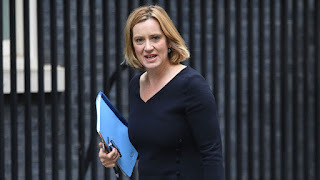 The Home Secretary said no single measure would tackle all the issues raised in the report, but rather a comprehensive approach focused particularly on domestic sources of support for all forms of extremism was needed.